Prey : what do they eat? African penguins take mainly anchovies supplemented with a little sardines. Of course they will not scorn other swarm-fishes, like crustaceans and squid, when they pass by. Through over-fishery there isn't much anchovy anymore. The most directly relative species (Humboldt, Magellanic and Galapagos penguins), and the little and yellow-eyed penguins too, mainly take fish too. The largest species, the emperor, eats mainly Pleuragramma, an icy fish who looks similar to the European herring, and for the rest krill and squid. 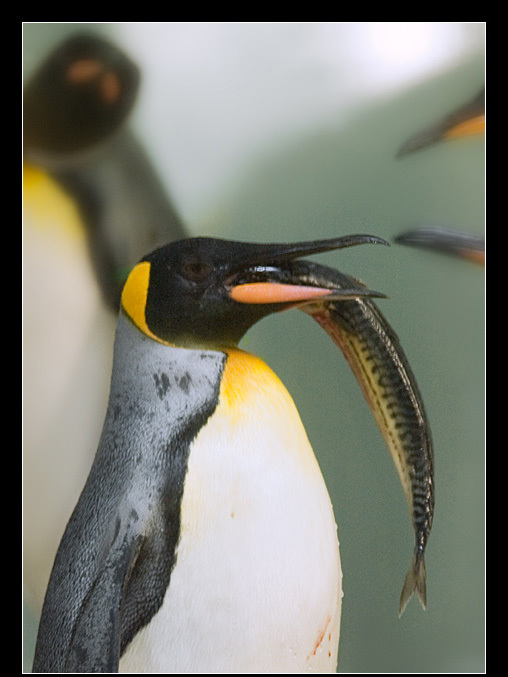 King penguins take sometimes squid but mostly little (about 4 cm tall) swarm fishes, so called lanternfish. These lanternfishes come almost till the surface of the water during night, but in the daytime they swim on a depth of 200 à 300 m. Because penguins can't see very good at night, they need light, ( see Sight), king penguins too need to dive that deep. The three smaller species (Pygoscelis : adélie, gentoo and chinstrap penguins) mainly eat krill. 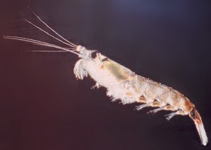 Krill is the general term (originally Norwegian language) for several kind of small, plankton-like, lobster-like animals. These krill need phytoplankton as food. Krill is also the most important food-source in Antarctica, as whales and seals also eat it a lot. Krill live in large swarms (from a few m3 till a several km3) with about 30000 animals pro m³, or multiple tons pro swarm. Crested penguins, living in moderate till sub-antarctic degrees of latitude, mainly take "krill-like" crustaceans but don't despise a careless squid or fish either.